Its maximum flight range reaches 30 km. 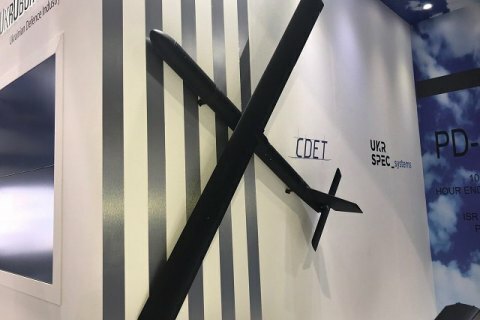 The Ukrainian state-owned company Spetstekhnoeksport has presented a new lethal aerial loitering system, RAM UAV, at the Unmanned Systems Exhibition and Conference (UMEX 2018) in Abu Dhabi (UAE). According to Defence Blog, the RAM UAV is a weapon system category in which the munition loiters around the target area for some time, searches for targets, and attacks once a target is located. The new system is 1.8 m long, has a wing-span of 2.3 m, and has a maximum take-off weight of 8kg. According to the company, the RAM UAV is a catapult-launched system with a maximum flight range of 30 km and a loitering duration of up to 40 minutes.